Rob "Bomber" Henderson remembers: "A320 AIRBUS by Thallion : This was bar far the most complex civilian flight sim I flew on the Amiga. 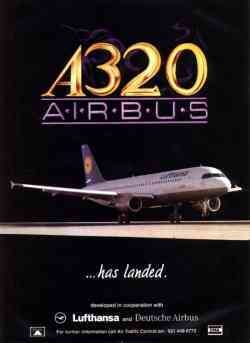 It was developed in conjunction with the airline LUFTHANSA of Germany. The sim came with a huge manual, a massive "notepad" containing Jeppessen airfield approach charts for almost every controlled airfield in Central Europe, and 4 high level navigation charts, and a massive poster of a real A320 cockpit." Adds Amelia Aerhar's aircraft - the Lockeed Electra - and scenery all along the route of her last, unfinished flight of 1937. Adds many aircraft and physics based flight models to 'Beseiged'. Enemy Engaged Comanche vs. Hokum Add your own face to the pilots.